Also known as Calcification, scaly feet and legs are slowly--and quite naturally--caused by a build-up of calcium salt between the scales of your canary’s feet and legs. Even in an otherwise healthy bird your canary's legs will appear dry and flaky. A heavy accumulation of this scaling may cause irritation to your bird and may even result in difficulty walking. This is definitely not a comfortable situation and of course can lead to overall ill health and a lack of singing. But while this "scaliness" CAN cause problems, it’s also one of the natural symptoms of aging. Scaly Feet on Older Canaries. Older canaries commonly have a heavy build-up of scales and the amount of scales is sometimes used to determine the age canaries. As Dr. Rob Marshall states in Canary Health, the “legs of young birds are cleaner than old birds and quite free of scale”. Some canaries, though, are susceptible to having the calcium salt problem their whole life. These Scaly Mites live in, and feed on, the scales of your canary’s feet and legs. In severe cases these mites will move up to the beak area of the face. 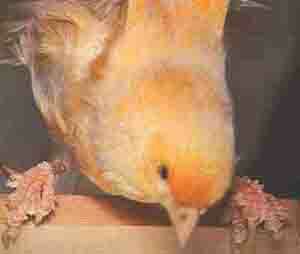 If your canary bird is relatively young and has scaly feet and legs, it is safe to assume you have a mite problem. Or at least your canary does. that is remaining in your canary’s system and soon die.
. Some mites like to hide in the cracks and crevices of your bird’s cage. If you haven’t treated for mites lately you should spray the bird and cage once per week for 4 weeks with this mite and lice spray. Mite and lice spray is good for killing mites that do not feed directly on the bird’s blood or living tissue. Feather mites, for instance, often feed only on dead skin and feather particles. will die but the spray has no effect on mite eggs. Therefore, you'll spray once per week so that you can kill the mites that have hatched out since the last spraying. After 4 to 6 weeks of using Scatt and mite and lice spray you will have effectively eradicated the pest. For more on mites see Canary Diseases. *Wash your canary’s feet gently in warm water. *Mix together 2 Tbs Vaseline and 1 Tbs Campho Phenique and keep in an air tight container. An alternative salve is baby oil, or you can use Vaseline exclusively, but the Campho Phenique will add some healing power to the process. *Very gently apply this mixture on your bird’s feet and legs every day for 5 or 6 days. *On about the 6th day the scales will begin to come off. *If necessary rub the scales off GENTLY. A wash cloth may help to pull the scales away but if they don’t come off easily, let them be. If the scales are pulled off before they’re ready, you can cause bleeding. 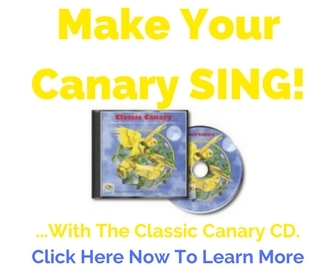 Within a week your canary bird will be foot loose and scale free! ...and that's SMART canary care. Return from Scaly Feet to the Canary Disease Main Page.